There is some concern that Emilio Bonifacio might not be eager to adapt to a full-time super-utility role with the Royals. KANSAS CITY, Mo. — Emilio Bonifacio, no longer the Royals’ starting second baseman after the free-agent signing of Omar Infante, could end up being traded before spring training. A club source told FOXSportsKansasCity.com that the Royals will listen to offers for Bonifiacio, who is arbitration eligible after making $2.6 million in 2013. Bonifacio had been in line for the second base job after hitting .285 with a .352 on-base percentage in 42 games with the Royals. 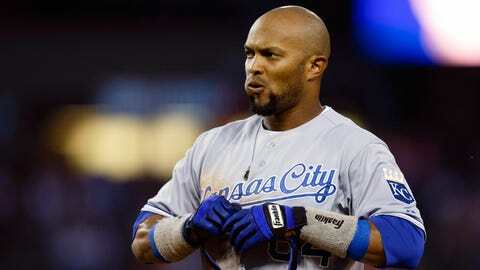 He was acquired from the Toronto Blue Jays in mid-August and almost immediately gave the Royals an offensive spark. Bonifacio also shored up the No. 2 slot in the batting order, moving into that spot Aug. 24 and remaining there for the rest of the season. But while club officials are enthused at the notion of using Bonifacio in a super-utility role — he can play all three outfield positions as well as shortstop, second base and third base — there is some concern that Bonifacio might not be eager to adapt to that role full-time. After being traded from Miami to Toronto, Bonifacio began last season as the Blue Jays’ starting second baseman. But by late April, he was hitting just .169 and his playing time began to diminish. He was mostly used as an outfielder in the final month before the Royals acquired him. Bonifacio did not indicate upon arriving in Kansas City that he was unhappy with his role in Toronto, but there was speculation that his disappointing play with the Blue Jays (.218/.258/.321) coincided with his diminished role to more of a utility player. Bonifacio, 28, was an everyday player with the Marlins in 2011 and flourished, hitting .296 with a .360 on-base percentage while stealing 40 bases. The Royals’ acquisition of infielder Danny Valencia this week gives them depth at the corner positions, and the Royals believe that Pedro Ciriaco could serve in the role of backup middle infielder. Ciriaco is skilled defensively, has above-average speed, and won’t be arbitration eligible until 2015. He made $502,000 last season.